I was the Wardrobe Mistress of Christ’s Hospital School from 1969 to 1978. 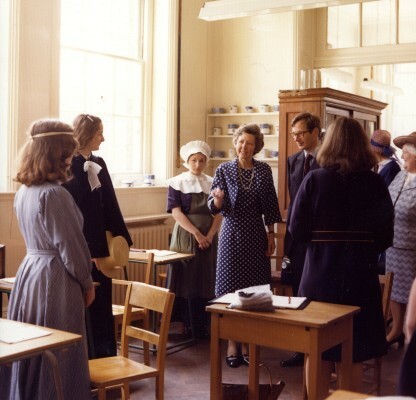 In May 1976 the Duke of Gloucester, who was the president of the school, came and spent the whole day with us, which was very unusual for royalty. These three photographs were taken on the day. The first photo is of me with the Duke explaining the replica costumes the girls were wearing. In the 17th century the school children had to make the clothes themselves. The second photo shows girls in school uniforms throughout the years: the one in the centre is late 17th centrury then it jumps to the 18th and 19th centuries. 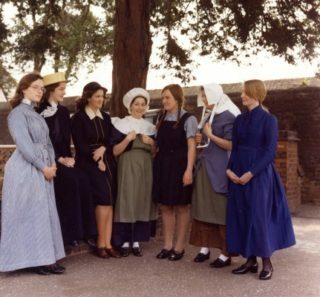 Third from the right is a girl wearing a 1930s gym slip and the third from the left is the Sunday uniform with black and gold trimmings. The one on the far left is an original hand-made dress from the late 1800s. The next photo shows two girls standing in front of the cottages, which are still there, wearing replicas of 15th and 16th century costumes. On Founders Day they used to dress up in these costumes too. The school provided all the uniforms. The fourth photo was taken from a hot air balloon of the whole school, which has now been converted to flats. 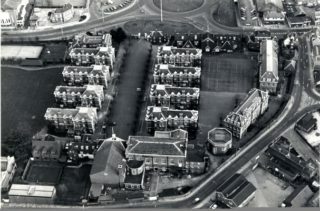 The eight houses where the girls all lived are still there, although some of the other buildings have been demolished. In 1979 we moved away to Norfolk and had 27 wonderful retired years, travelling around a lot. I came back in 2006 after my husband died and now live in Chauncy Court which is part of the old Christ’s Hospital buildings! This page was added on 15/05/2010. It’s suddenly come back to me! Our Sixth Form Entertainment of 1971 – Ashbournella! There was a tremendous mix-up of all the items of our uniform… cherry reds worn with hockey boots… wincyettte nighties and blazers… Sad Sunday Sacks and Green Aprons. That we so proudly wear! Alex and I wrote this awful song at midnight in 6s bathroom. EEEK! But on the night , it brought the house down. Goodness knows what SWSNBN thought. Hopefully it might have brought on a bit of a funny turn. Sue Knight, are you sure it was House 2 your Mum was in and not 3? We had a Mrs Graham as Housemistress in 3’s and she was wonderful – i’d love to get back in touch with her…..
I’ve only just seen this, the picture of the 2 girls is indeed Nicky Taylor & myself. I’m not sure why we were chosen to dress up & meet the Duke. I was quite shy & slightly terrified. My friend Carol Wootton was a 9s girl, of which we were all quite envious as we all admired your elegant style of dress. How amazing that you now live at CH. I haven’t been back for years. Hope you are well. she has very fond memories of the place and my son was the only baptisam in the school chapel before it was demolished to build Tescos Happy memories….. I was “dressed up” by Miss Richards – possibly the best thing about being so tall was I had big feet – so, after a few years of being in hand-me-down shoes, I was taken to have NEW shoes!! I remember the Duke’s visit quite clearly – and all the various things we had to do that day! It was also wonderful to meet Miss Richards again in 2008 when she had retired to the school, and we had a small gathering of girls from various years… many memories which we shared together! Yes, I was at CH 1964 – 72, and although Dickie – Miss Richards – probably dominates our memories of that period, as Munch has said, I do remember you Veronica and enjoyed reading this page. I also remember you Aurelia – of course in the lower IVth only ever knew you as Miss Parsons and never guessed you had such a beautiful name! My abiding memory is of the wonderfully dramatic black and white outfit you often wore – very Carnaby Street – which we imagined was tolerated by other more conventional members of staff because you were the art mistress! How surprised I was to come across these pictures. I am the 13 year old (now 53) in the frilly cap! I believe that the picture of myself and Lucy standing outside the cottages was made into a jigsaw. It was a huge event at school when the Duke of Gloucester visited. I was at CH from 1971-76, house 6. I was in House 6 two years below Angela (known as Munch). Girls from House six were chosen to be “Nines Girl’s” ( as the original wardrobe department was in the old 9’s house in the oldest part of the school, until a new extension was built at the back of the headmistress’s house in the early 70’s I think). Our role was to assist the wardrobe mistress with the issue /condemning/replacement of uniforms (which in my day included every article of clothing even underwear!). In 1967 when I joined the school Miss Richards ( needlework mistress) was the Wardrobe mistress and Veronica joined in 1969 to assist Miss Richards who retired in 1971. Veronica, as one of the few members of staff who lived outside the walls of the school gave us a link to “life outside” She was such a vivacious and engaging person that our “daily duties” were something to look forward to ( even allowing for sorting through baskets of worn out pants and vests!). I left in 1973, so missed all the excitement of the Duke’s visit but I know Veronica contributed so much to a number of other events in the school. I still keep in touch with her and she is just as vivacious and positive at the age of 87. Hello Angela! You may not remember me but – I taught art at C.H. from ’65 to ’66 ! It was a fantasric experience & all the puplis were ace! Miss Blench was head at Red House, where I lived, eventually we did have a good relationship -after she “trained” me to be an ettiquette aware member of staff! I remember sitting in Chapel on Sundays on duty (to take out any pupils sick! ), also taking walks on Hertford Common – when all the “little Angels” took off & galloped away – leaving me in my minidress & heels trailing behind!! It was a tremendous intro to teaching & I think often of my days at C.H. I left to take an art position in Trinity College, Carmarthen, where I stayed until retirement in 1996. I attended Christ’s Hospital Hertford 1964 – 1971, and there was certainly no title “Mistress of the Wardrobe”. Our uniform, in it’s many variations, was chosen by Headmistress Miss DR West, and our Needlework Mistress Miss J Richards. These Mistresses left 1971/2, so maybe Ms Humphrey began to superintend uniform after this? In all our memories of Christ’s Hospital, Hertford, a Veronica Humphrey has never been mentioned. May we know more about you, Ms Humphrey?